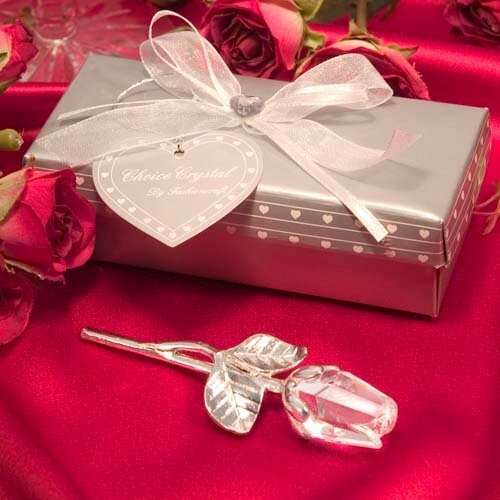 Guests will love displaying these crystal roses in their homes after the big day has passed. Add a touch of elegance and shimmer to your reception tables with this 3.5" long rose that features a crystal bud atop a silver metal stem that is embossed with leaves. 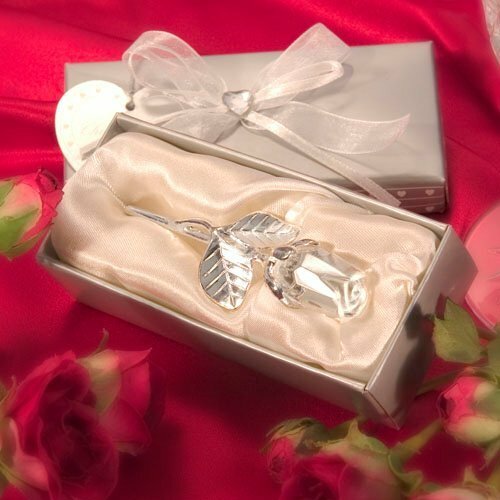 Each of these long stem rose wedding favors is nestled on satin within a silver gift box. Each gift box is then tied with an organza ribbon and heart-shaped hang tag that reads "Choice Crystal by Fashioncraft" for a gorgeous presentation. Can I order and ship to Mexico, this is for a destination wedding. Can I have the order sent to the Hotel Resort? We only ship to the continental US at this time. My apologies for any inconvenience. I would like to know if you have a larger crystal stem rose wedding favor or any other flower that is larger than the 3.5"? Yes, we have the Choice Crystal Gold Long Stem Rose Favors and the product dimension is 4.25" x 1.875" which is bigger than the Crystal Long Stem Rose Wedding Favors.